It was going to happen sooner or later: the clean minimalist Outlook.com will soon start displaying advertisements alongside your inbox and emails. Microsoft announced users in the U.S. and Brazil will be the first ones to see the new-format ads, christened versaTiles. Australia, Canada, France, Germany, Italy, Japan, Netherlands, Spain, and the United Kingdom are set to follow suit soon. The versaTiles are basically display ads based around flexible-sized tile strips that appear along the right-hand side of the screen, next to your main inbox view. They also appear when you are inside an email. At first glance, the ads appear similar to the text ads Gmail users get in their inbox, but when you hover over the Outlook ads, they reveal images, videos, or more info. The Outlook ads are targeted at online retailers, who can pick from three templates for slideshows, videos, images, or catalogue style adverts. “They’re built with the same modern-design philosophy to ensure people using Outlook.com have a great experience and see ads in places that can enrich their mail experience, not deter from it,” wrote Microsoft Advertising General Manager in a blog post announcing versaTiles. There are between four to five ad tiles on the right side of Outlook.com and advertisers can buy an entire lot and customize each tile to show different content or messages. In a demo video of the ad slots, Microsoft showcased one advertising partner, Duracell, which experimented with all the modules offered via versaTiles. 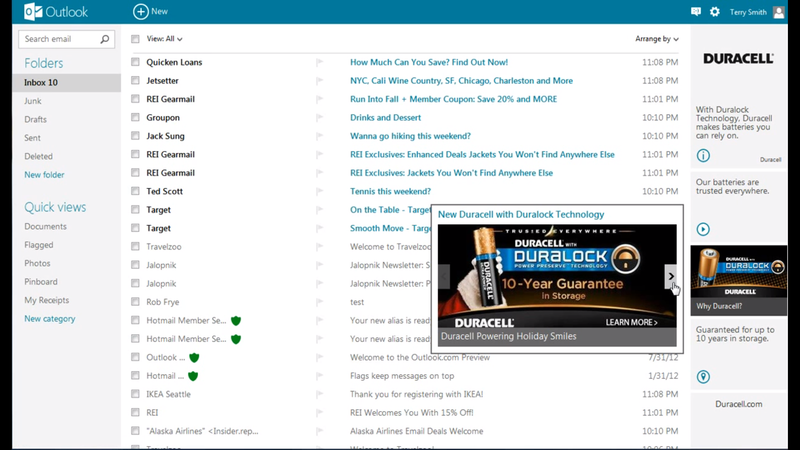 Since Outlook.com is a free service, used by 60 million people at the last count, ads in the interface were deemed to arrive in your inbox sooner or later. Perhaps the most interesting part of the Microsoft ad strategy with Outlook is that you won’t see the standard type of banners cluttering up the site. Instead, you’ll see more carefully prepared campaigns. However, since Microsoft does not scan your email to serve ads based on them —as Google does with Gmail— the chances of the ads being as carefully targeted as Gmail are not that good. This could mean that, even though they are nicer to look at, Outlook.com’s ads would not be as relevant to you as Google’s ads.